Oblong Industries has received a significant investment from Greenspring Associates, the Owings Mills, MD-based firm that focuses on companies in expansion stage, alongside Silicon Valley-based Industry Ventures and Austin-based UTIMCO, the investment arm of the University of Texas. These firms are joined by historical partners Morgan Stanley and Foundry Group, bringing the round of growth funding to a total of $65 million. The investment will allow Oblong to accelerate product development, launch innovations faster, and ramp an aggressive strategy of expansion into new territories. Oblong, headquartered in Los Angeles, is the developer of the Mezzanine product for visual collaboration and of distinctive data visualization solutions at architectural scale, all based on its g-speak technology. The g-speak software platform enables multi-machine, device-agnostic spatial operating environments offering simultaneous input modalities including gesture and touch. Current customers include NASA, PwC, and IBM, along with many dozens of others in the Fortune 500 and Forbes Global 2000. 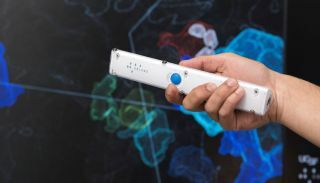 In addition to its customer base of global businesses, Oblong has established a foothold in government, education, and healthcare, demonstrating the sector-agnostic value of immersive spatial computing. UTIMCO, Industry Ventures, and Greenspring Associates join Morgan Stanley and Foundry Group, who have also participated in the round. As returning investors, both firms see the wide market potential for Oblong’s products and solutions.